It has never been easy to be an adolescent, but by the look of things, twenty-first century teenagers may be having a harder time than ever. One contributing factor—the one that public health agencies and the media seem most willing to discuss—is a ballooning epidemic of mental health problems in teens. Meanwhile, an equally grim developmental disability crisis has been unfolding for years, affecting at least one in six American children and teens but receiving little attention. The NCS-A was conducted with over 10,000 teens from 2001-2004. 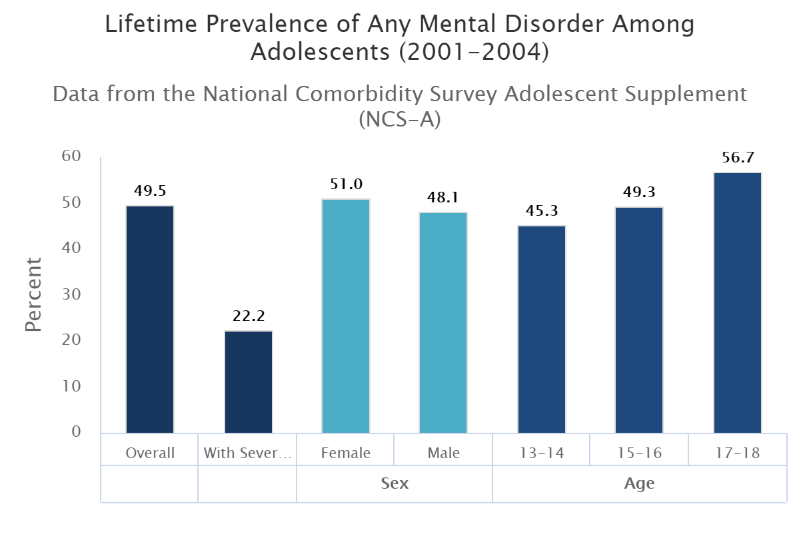 The survey found that half (49.5%) of U.S. teens ages 13-18 suffered from at least one mental disorder (see chart), including one in five with behavior disorders and three in ten with anxiety disorders. The age of onset for the disorders often preceded adolescence by many years (for example, half of affected adolescents developed their anxiety disorders at age 6). Additionally, the impairments were often severe, ranging from 22.2% to 27.6% of teens, which is striking given that the survey measured “higher thresholds of impairment that required endorsement of ‘a lot’ or ‘extreme’ impairment in daily activities, or ‘severe or very severe’ distress.” Acknowledging that its own mental health surveillance data have significant limitations, the Centers for Disease Control and Prevention (CDC) praised the NCS-A because of its unique focus on childhood mental disorders and its inclusion of disorders not measured in other studies. What are the likely culprits? Regardless of specific terminology, one burning question arises: why do children and teens currently have such high levels of mental and neurologic dysfunction? Although the pro-Pharma health care system in the U.S. makes it socially taboo to say so, vaccines and other pharmaceutical products are some of the most likely culprits. As has been discussed in other World Mercury Project articles about children’s health, this supposition is backed by sound science. Researchers from the Yale Child Study Center published a retrospective case-control study in Frontiers in Psychiatry that considered whether prior vaccination in a national sample of privately insured children and adolescents (ages 6-15) was associated with increased incidence of seven neuropsychiatric disorders. For the time period from January 2002 through December 2007, the Yale researchers found that children with four diagnosed disorders—anorexia nervosa (AN), anxiety disorder, tic disorder and obsessive-compulsive disorder (OCD)—were more likely than matched controls to have received a flu shot in the preceding 12 months. There were also associations between prior receipt of several other vaccines (hepatitis A, meningococcal and Td) and some of the neuropsychiatric diagnoses. A prospective case-control study published in Brain Injury used the Vaccine Safety Datalink database to zero in on the relationship between thimerosal-containing vaccines given in the first six months of life (for children born between 1991 and 2000) and the long-term risk of diagnosis with “disturbance of emotions specific to childhood and adolescence,” a diagnostic category abbreviated as ED. The results showed a significant relationship between vaccine-related mercury exposure and the subsequent risk of an ED diagnosis, with a notable dose-response effect. As a side comment, the authors note that occupational health specialists have recognized depression and other psychological disturbances as symptoms of mercury poisoningfor decades. Other recent research observes that exposure to neurotoxic and excitotoxic vaccine ingredients (such as thimerosal, aluminum adjuvants and monosodium glutamate) can lead to changes in the brain, adversely affecting the long-range connectivity that makes it possible to pay attention and engage in big-picture thinking. This abnormal connectivity is a key feature not only of ADHD but of leading neurodevelopmental conditions such as autism spectrum disorder (ASD) and tic disorders. A TIME article on the “startling” rise in teen depression laments the fact that there has not been “a corresponding increase in mental health treatment for adolescents and young adults.” This prospect of a vast untapped market for greater pharmaceutical sales may offer one clue as to why many powerful organizations are focusing on the mental health aspects of teenagers’ wider health crisis. However, other evidence indicates that some pharmaceutical products (in addition to vaccines) may be contributing to mental health problems. A Psychology Today reportnotes that “aggressive marketing by drug companies…has transformed mild depression and even sadness into a disease of ‘serotonin deficiency.’” At the same time, there has been growing awareness of “the potential for certain prescription medications to increase the risk of psychiatric symptoms and suicidality.” Classes of medications that come with black box warnings mandated by the U.S. Food and Drug Administration (FDA) include some of the very drugs used to address both psychiatric and neurological conditions, such as antidepressants and antiepileptics. In 2009, the FDA added warnings for the class of drugs known as leukotriene inhibitors (LTIs), which clinicians recommend for the control of allergies and asthma. Although sales of LTIs abruptly dropped as soon as the warnings appeared, the cautions did not manage to save an 18-year-old asthmatic who recently committed suicide after taking an LTI. The CDC tells us that “mental disorders among children are an important public health issue because of their prevalence, early onset, and impact on the child, family, and community.” When an adolescent is too incapacitated by a mental or neurological disorder to pursue his or her education or a career, the whole country loses. Young people’s brains and emotions get plenty of a workout just by engaging in the process of growing up. Piling on more brain-scrambling pharmaceutical products to treat conditions that are often iatrogenic to begin with is probably not what most teenagers need. In Part Two, World Mercury Project will look at some of the factors currently being offered as explanations for the epidemics of mental and neurological disorders in adolescents.